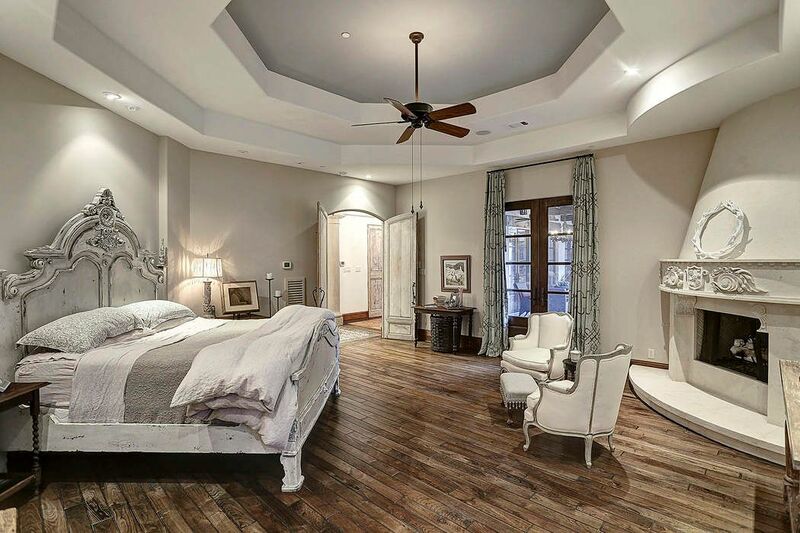 425 Hedwig Road, Houston, TX 77024 | Martha Turner Sotheby's International Realty, Inc.
European flair exudes from this gorgeous home resplendent in fine architectural detail. 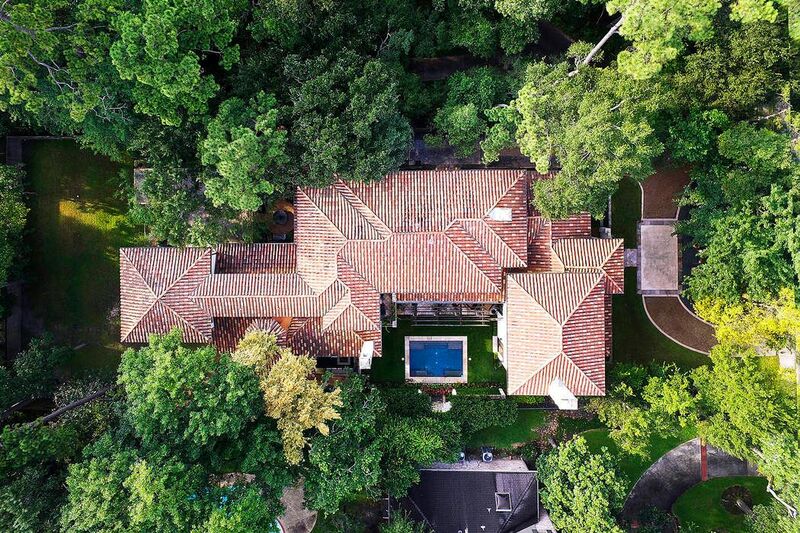 Aerial view highlights Terra Cotta tile roof. 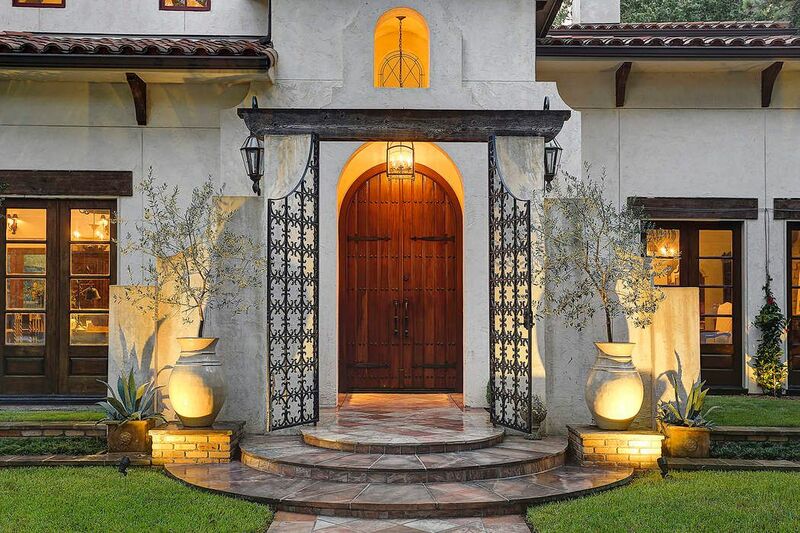 The entrance to this refined European style architecture is enhanced by custom made iron entry gates, period lanterns, landscape lighting and custom double entry doors. 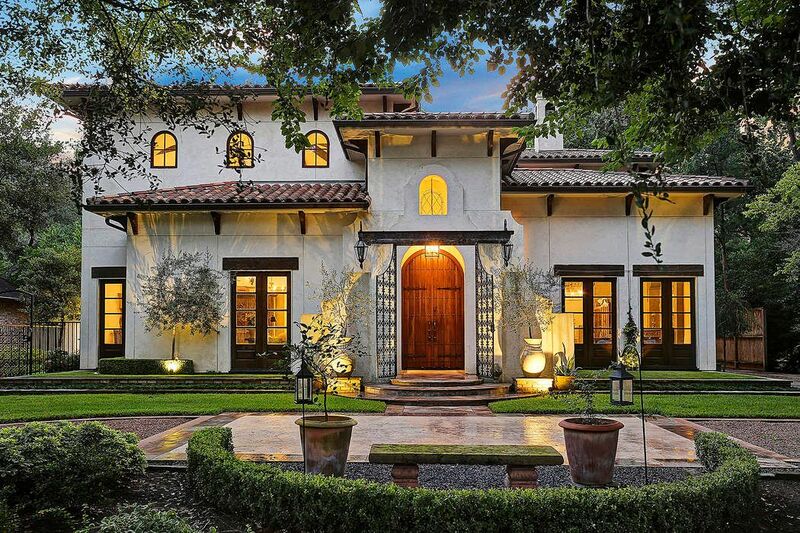 Great view of home showcases the integrity of the European style architecture. As one enters the front door, the stunning gallery defies all expectations! 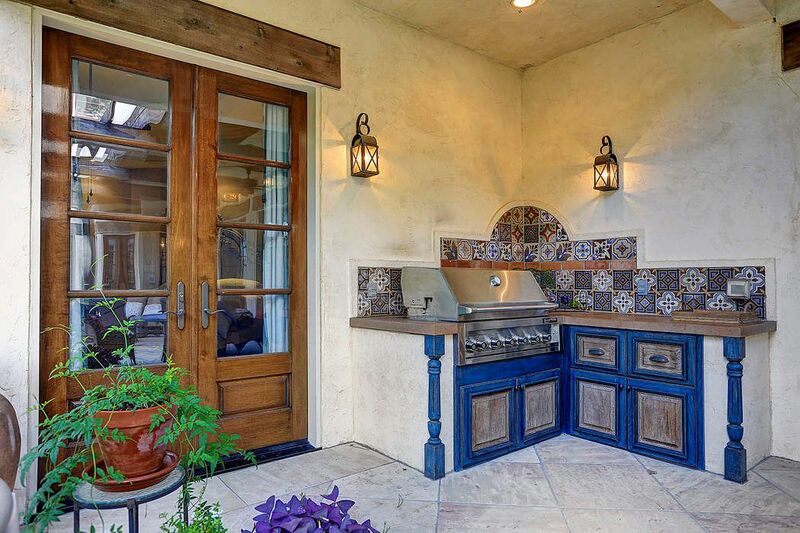 It is anchored by Mexican Saltillo tile embellished by striking hand-painted tiles. 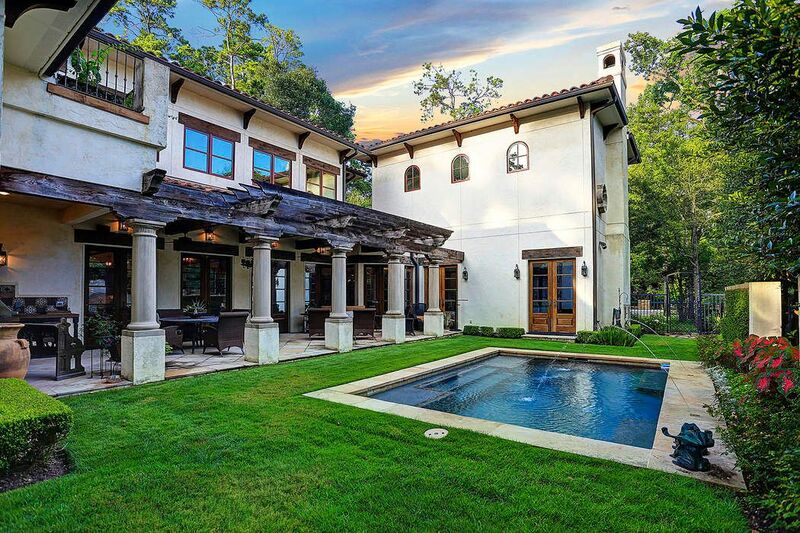 Extraordinary architectural collaboration is evident in this home infused w/quality. 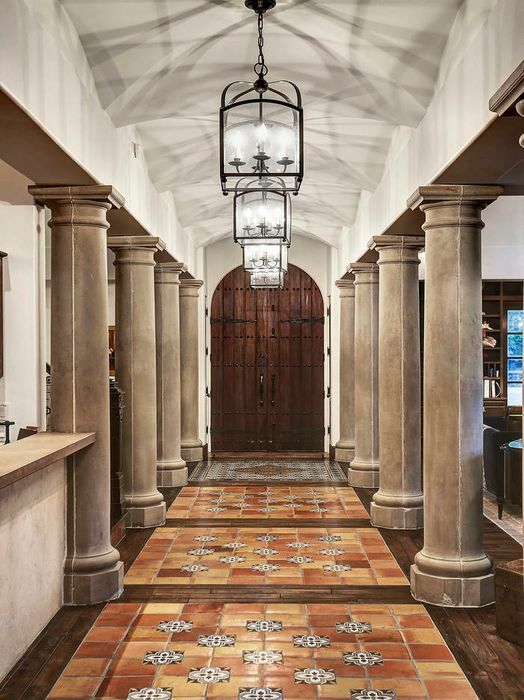 Flanked by limestone columns, the majestic gallery artfully interlaces the flow for entertaining by uniting the living room, dining room and kitchen. 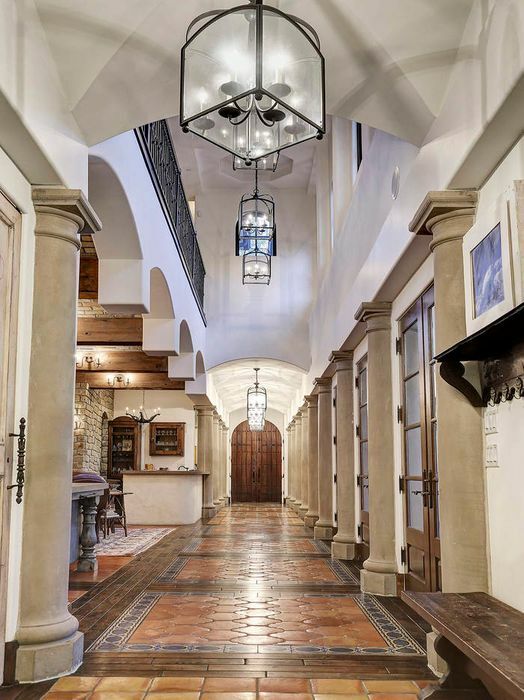 Circa lighting lanterns grace the groin-vaulted ceiling. 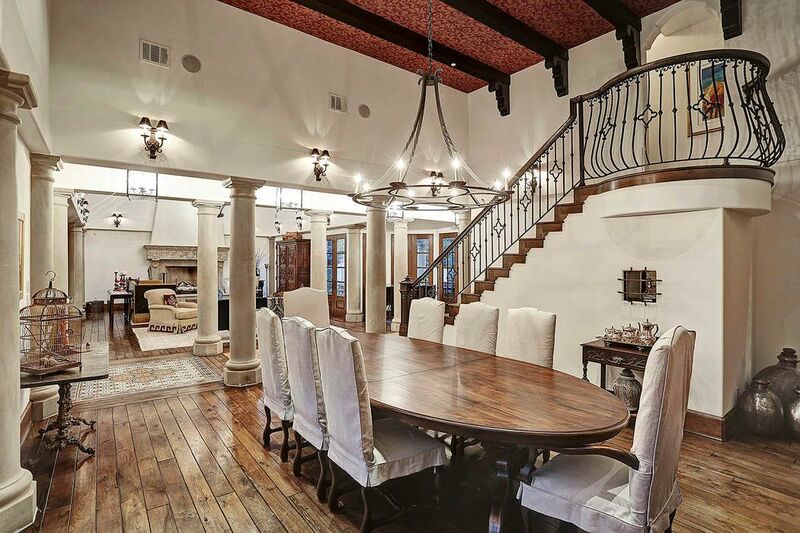 Designed to embrace the dramatic staircase, the grand dining room is replete with Brazilian walnut wide plank hardwood floors, high beamed ceiling, stone clad buffet nook and two sets of French doors that lead to front lawn. Every detail has been carefully selected and crafted in the double height living room . 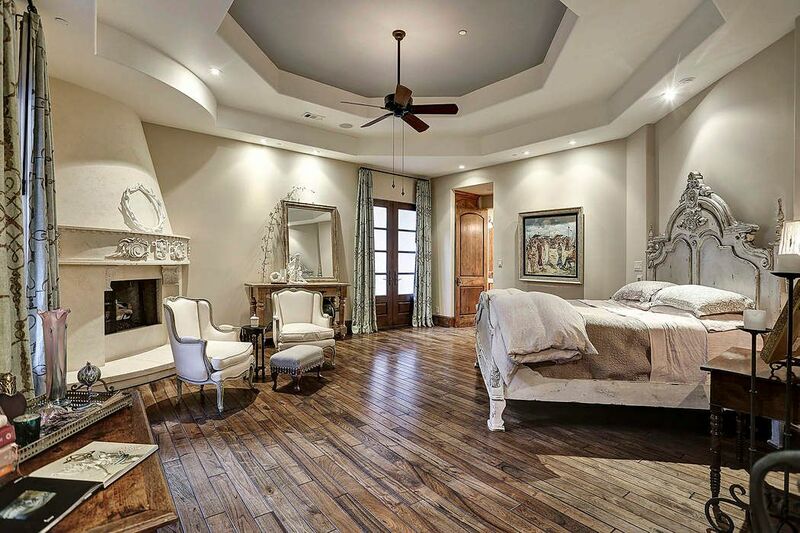 Features include beamed ceiling, Brazilian walnut wood floors & hand carved masonry fireplace. Banks of French doors encompass a commanding view of the garden. Fantastic view of gorgeous living room. Photo renders great view of staircase highlighting the walnut treads and custom tile risers. A delightful piano nook is to the left. 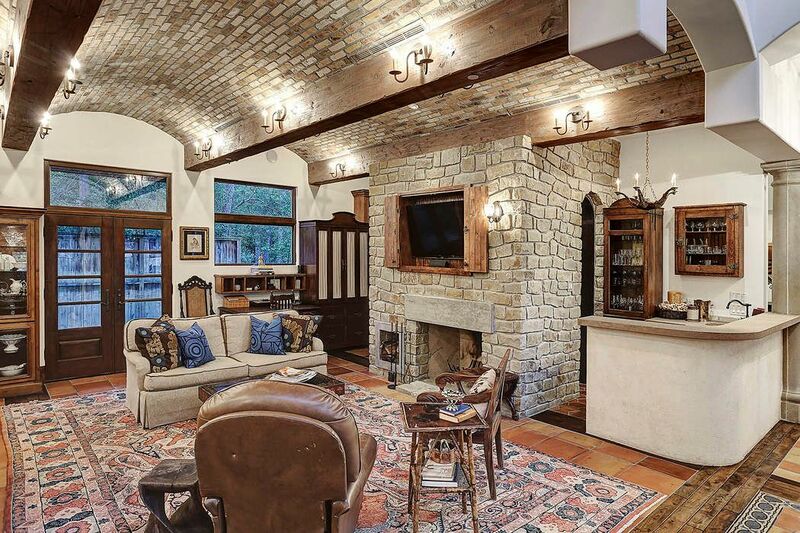 Perfect for family gatherings, a stone surround fireplace makes for a warm family room adorned by a thin-tile brick barrel vaulted ceiling. A full service wet bar complete with wine room accompanies the room. Note sconces on beams. Large island topped with on-site built concrete counter top. Mexican Saltillo tile flooring with inlaid Adler wood. 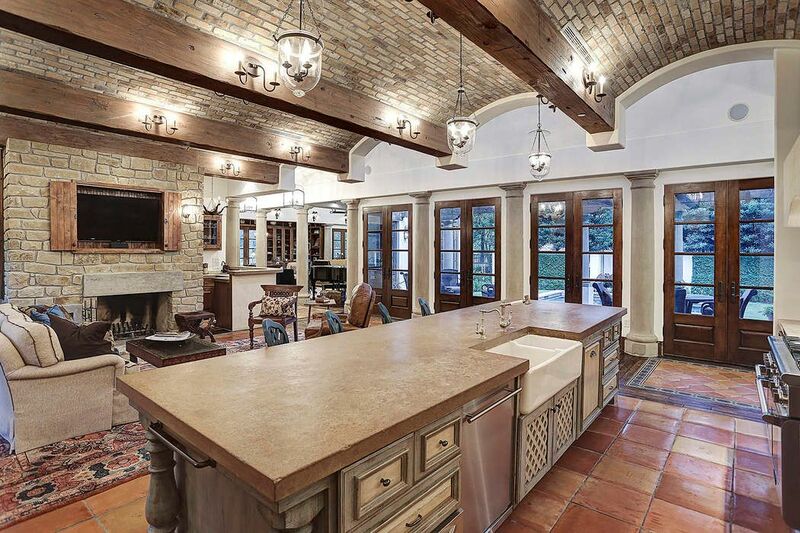 View provides insight into how marvelously the kitchen and living areas unite for gracious living and entertaining. 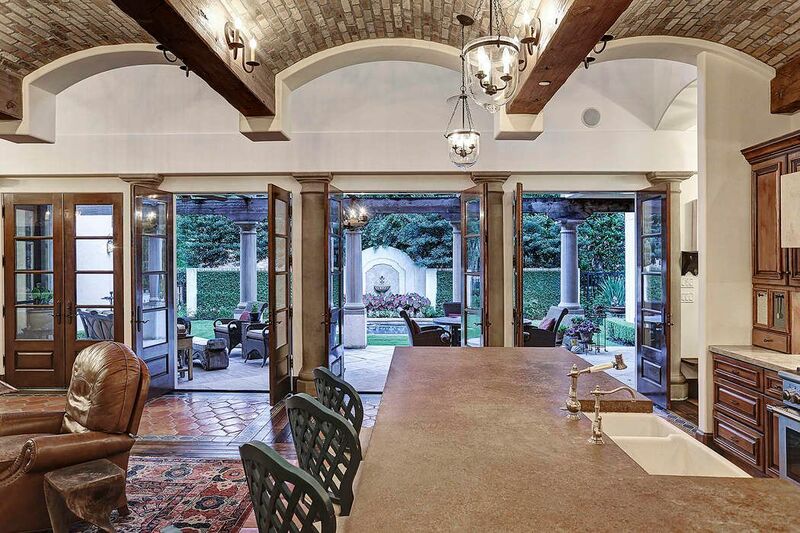 Indoor and outdoor living blended perfectly to enjoy veranda, summer kitchen, courtyard and sparkling pool. 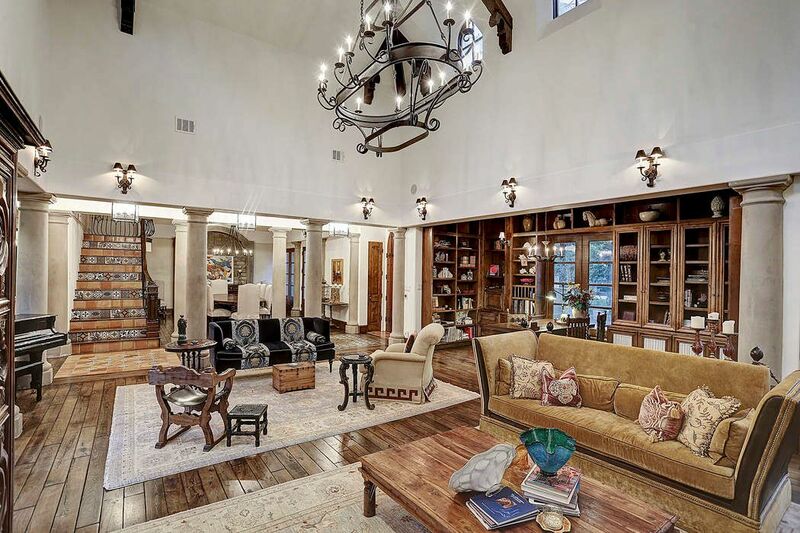 Columns and hand hewn ceiling beams add to the rich character of the inviting area. 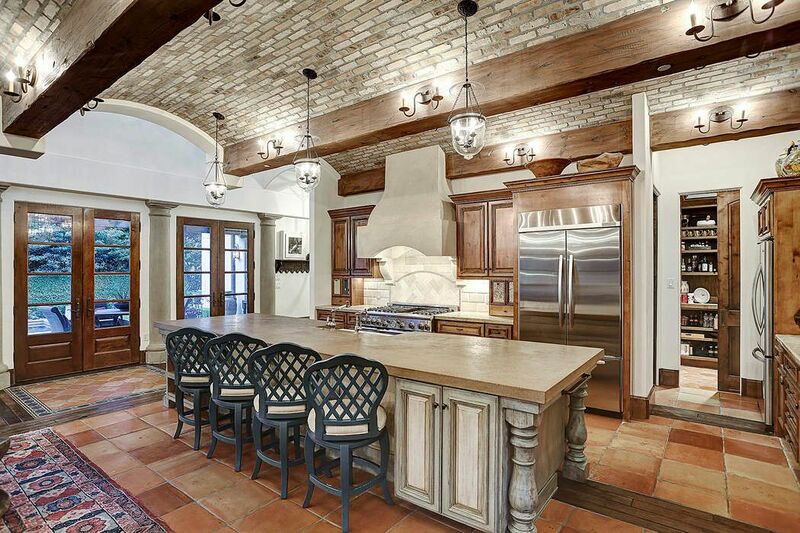 Chef's kitchen features plaster vent hood, 2 Kitchen Aid French door refrigerators, Thermador 6 burner gas range with griddle and double ovens, Asko dishwasher and Kitchen Aid warming drawer. Custom Alder Cabinetry adds depth to the spacious open area. Massive concrete topped island with pull-up seating is designed to accommodate a large gathering. Great-size walk-in pantry. The luscious master suite enjoys a feeling of secluded removal. 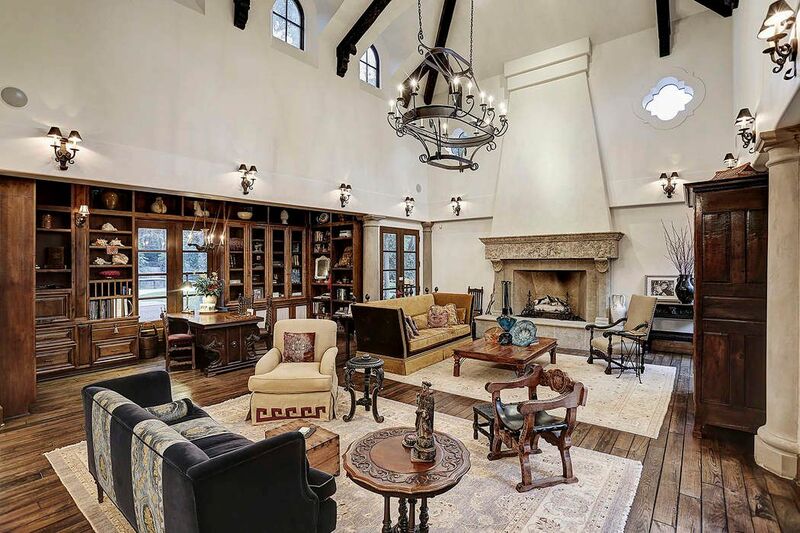 Brazilian walnut floors, limestone cast fireplace and deep tray ceiling enhance the beauty of this private oasis. 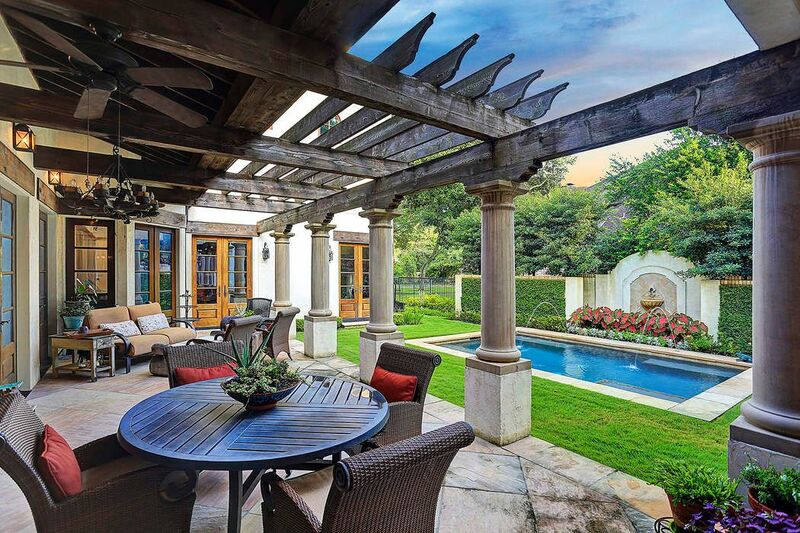 Serene vistas of the pool and outdoor seating area are afforded by two sets of French doors. 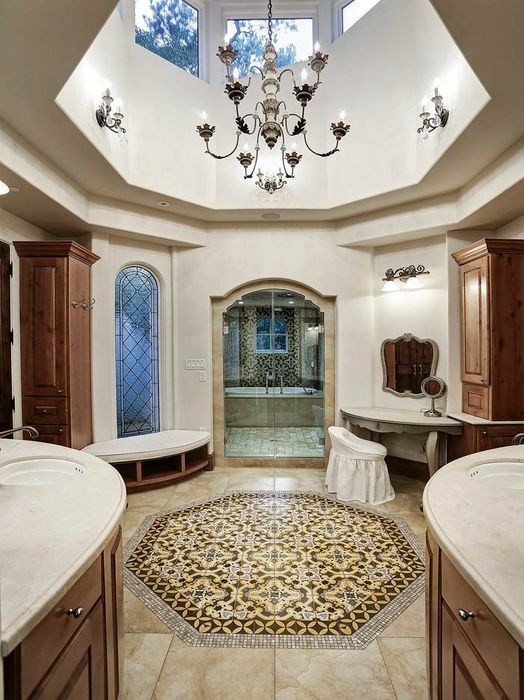 Striking architecture detail showcases the outstanding in-laid Mosaic tile centerpiece. Dual demi-lune custom vanities topped with hone marble countertops. 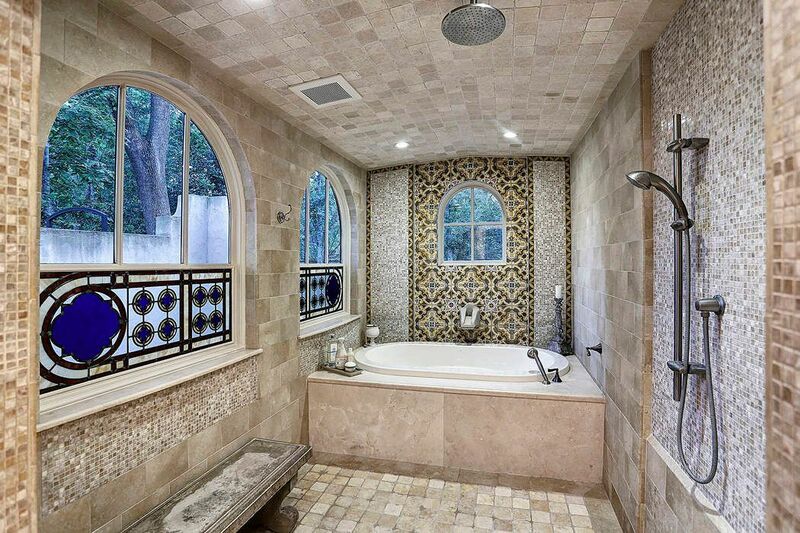 Stain-glass windows provide privacy in this beautiful wet area enhanced by tumbled travertine tiles, custom tiles in bathtub surround and decorative mosaic piece. Upstairs gathering room with oak hardwood floors. There is a half bath, coffee bar and under counter refrigerator. French doors lend access to balcony. 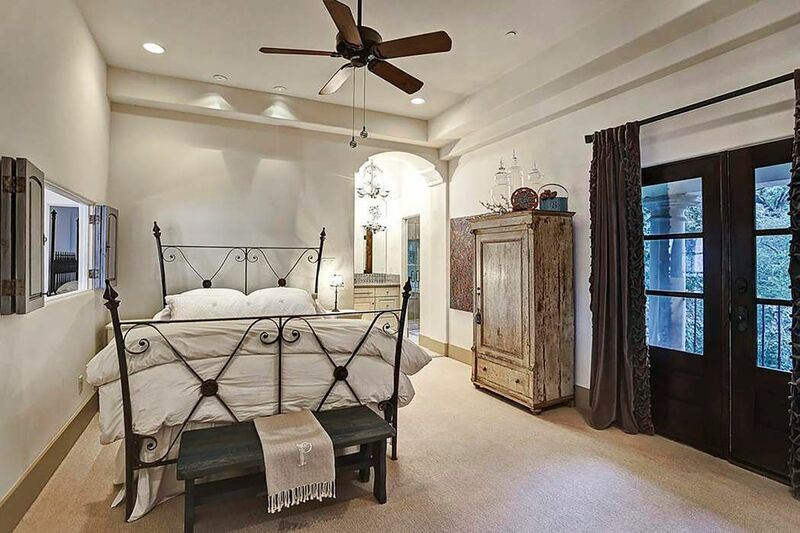 Beautiful bedroom graced by fabulous entry doors. Wonderful size for guests or family. 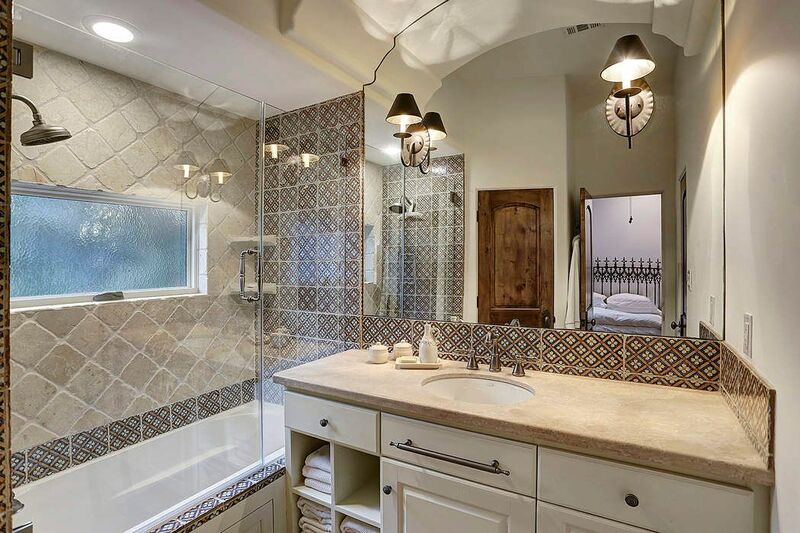 Ensuite Bathroom with stunning wet area for bath walk-in shower. Walk-in closet beautifully finished! 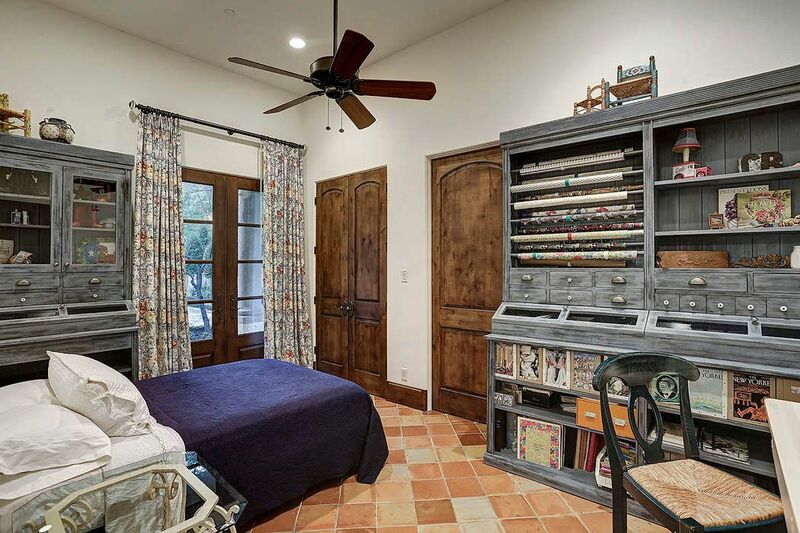 Versatile downstairs space could be used as guest room, craft room or quarters. French doors with view of garden. 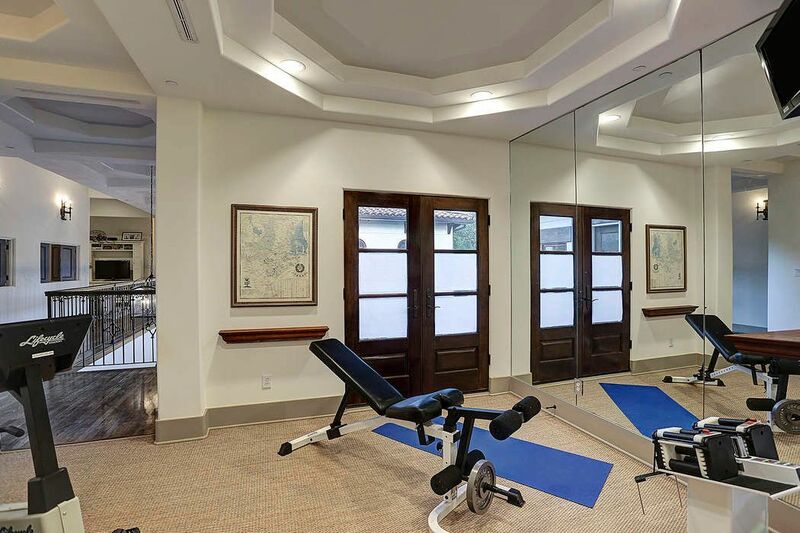 Exercise room opens to large 14 X 6 balcony overlooking pool. Note layered tray ceiling. Hand-hewn ceiling beams add character to the veranda with multiple gathering choices. 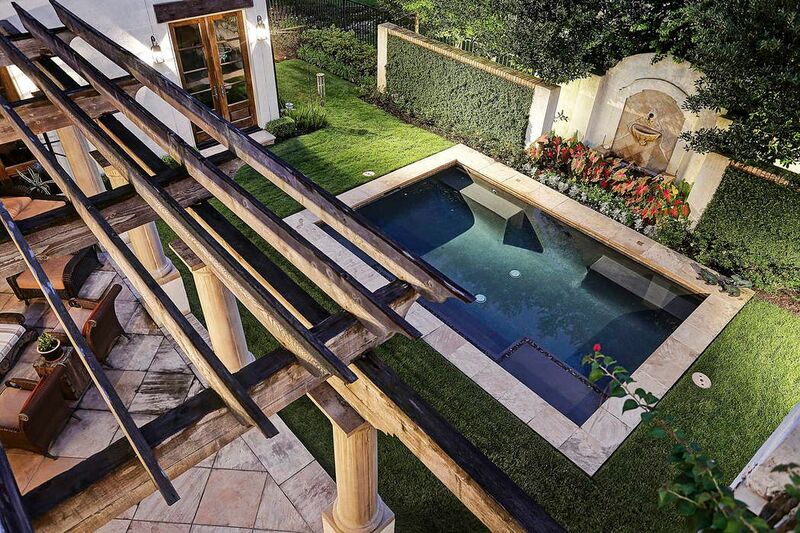 Note beautiful landscaping framing pool with fountains. Raised view of property allows appreciation of the hand-hewn ceiling beams on the veranda. 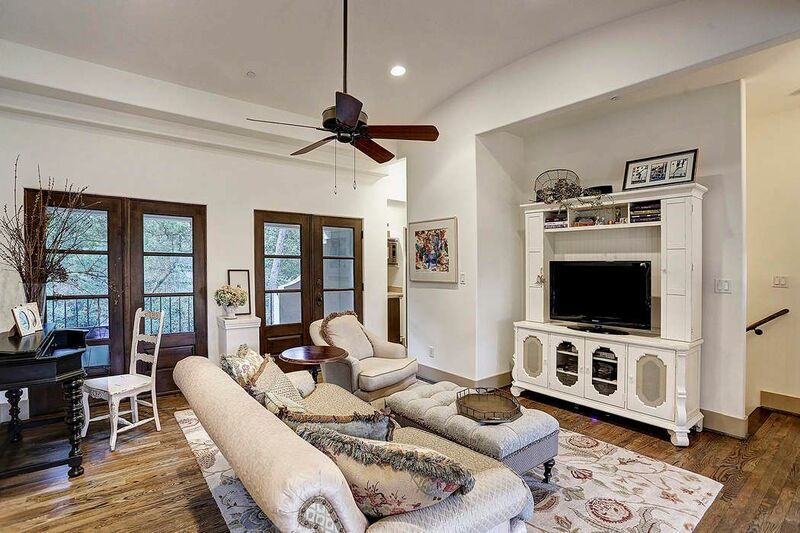 $2,850,000 5 Bedrooms4 Full / 2 Partial Baths6,585 sq. ft.
European flair met with grandeur. A blend of inspiration and striking architecture are woven together to create a luxurious yet comfortable lifestyle in this exquisite home. Majestic gallery flanked by limestone columns unites 2-story living room, formal dining room, den with wine room and chef’s kitchen. Four bedrooms with en suite baths to include one casita. Banks of French doors allow breathtaking view of veranda and pool. 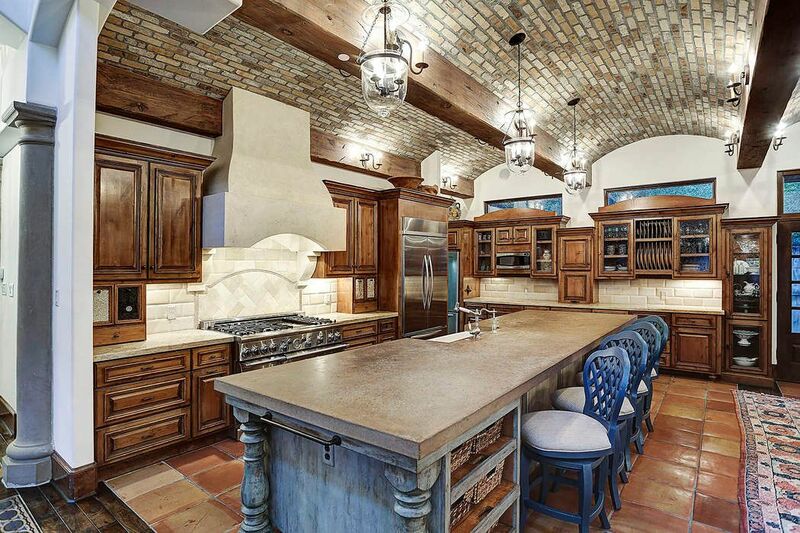 Master down, beamed ceilings, Brazilian walnut floors, three wood burning fireplaces and summer kitchen. 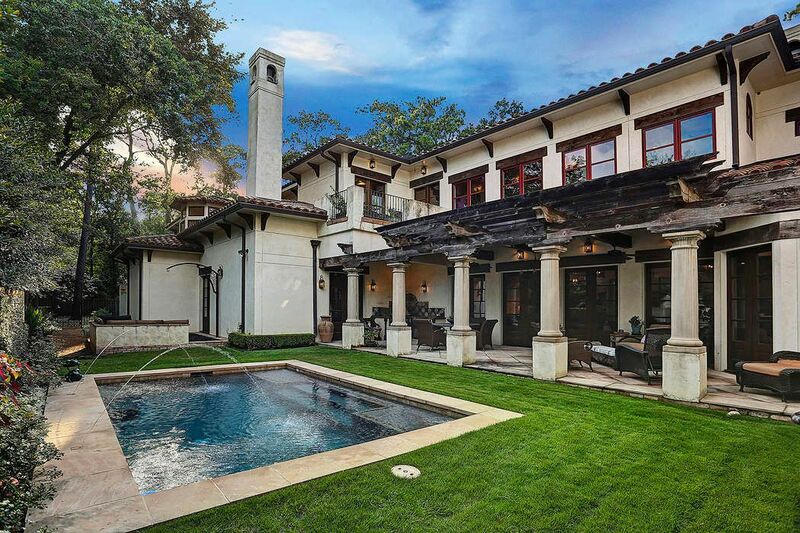 Do not miss this masterpiece of a home. Selections made from owner's extensive travels and resourcing of fine materials throughout the property. Zoned to Memorial Drive Elementary, Spring Branch Middle and Memorial High Schools.